In case you have not noticed, being healthy and fit is all the rage right now. So, if you have a passion for wellness and an urge to become your own boss, you are in luck. There is no shortage of opportunities to build a profitable business. Besides, we have seen numerous types of wellness companies accommodating various needs and wants of people across all segments of the population. You can take lessons from entrepreneurs helming flourishing organizations to steer away from common pitfalls. Of course, what path you decide to follow depends on your ambitions, skills, experience, and desired lifestyle. Those who want to open a physical location and attract clients there have to pay close attention to the type of business that makes the most sense. In other words, do a market research and identify the target audience. Depending on your findings, launch a wellness studio, clinic, spa, yoga studio, or retreat center. Something trendy, such as a juice bar or organic café could also do the trick. Take your time finding a location, which can really make or break your business. Ideally, it should be close to where your clients live, have parking space, and be visible from the street. At last, figure out whether you should buy or lease the space. While some businesses require you to physically present in a certain location, others allow you to work remotely, from wherever you please. To make the right call, you need to know where your talents and interests lie. In case you seek the former model, consider health and wellness coaching. This field actually encompasses a multitude of professions such as health coaches, nutritionists, personal trainers, holistic health counselors, and yoga instructors. Decide whether you want to work with clients 1:1 or offer group sessions. You may also focus on corporate or ordinary clients. Make positive and healthy changes in people’s lives. This one is a bit more specialized in terms of the target clientele. Namely, as the population grows older in most states around the globe, the demand for elderly care workers is on the rise. In case you want to avoid overheads, you can simply become an aged care worker. This term refers to people acting as personal assistants, assistants in nursing, personal care workers, as well as community or home care workers. There is a wide range of wellness and reablement programs like reconnecting aging individuals with events in the community, family life, and their social circles. It is also possible to package your work into online courses for extra profit. Speaking of which, not all wellness businesses revolve around a particular service. You also have an option to sell physical or digital products. They can be everything from (e-)books on wellness to personal care items like essential oils. Here, you might want to tap into natural health trends that are reshaping the whole wellness industry. Just be genuine and steer away from ripping people off and promoting shady merchandise. For instance, if you want to sell a dietary supplement, it is best to opt for those that are backed by science or have helped you achieve your personal wellness goals. Your good reputation is everything. Technology and new media are making big waves in the wellness industry. Getting on top of these trends is linked to amazing lucrative potential. One idea is to partner up with developers or put your own skills to good use. Come up with an app that supports people in their efforts to boost their health and well-being. In recent years, fitness, nutrition, tracking, corporate wellness, and buying guide apps are gaining traction. If that does not sound like your cup of tea, get into software tailored to supporting other wellness entrepreneurs. Finally, you may ponder creating a wellness podcast or a blog and monetize it. To get the ball rolling, assess your goals and skills. Commit to something you are passionate about. Work out a sound business model and find your target market. Follow tried-and-true steps to get the operations off the ground and acquire well-paying clients. Note that some of these ideas are complementary to each other, so feel free to combine them. At the same time, you should bear in mind that a great idea is just the beginning. The hardest part is translating your vision into reality and spurring long-term growth. So, keep up the pace with trends and changing consumer preferences. 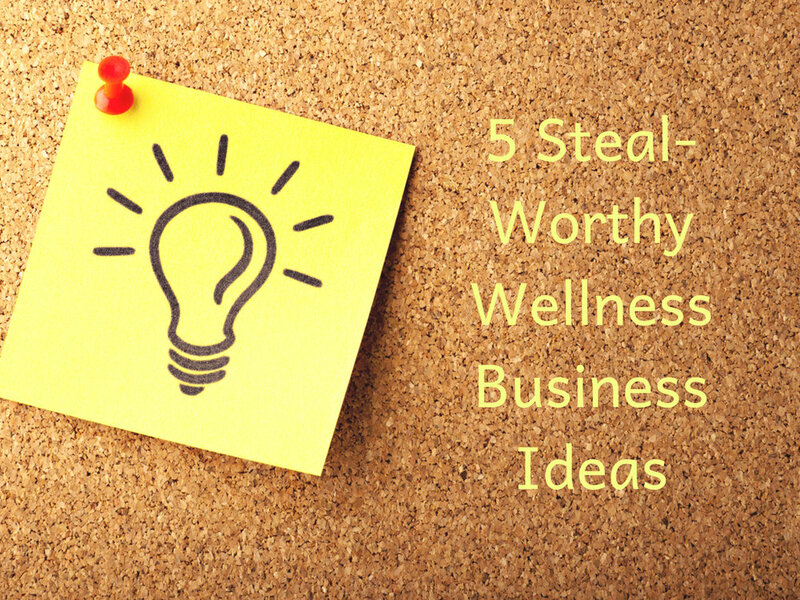 Create an irresistible offer and get on top of your wellness game.